As we've reported, Harmer-Schau is holding a Worldwide Philatelic Auction next week, which features a range of mail related to rocket and space flight alongside some exciting unused stamp lots from America and Rhodesia from the 1910s. However there are items included in the sale which will interest collectors far outside the stamp-collecting community and none more so than the Arthur Clime/Alexander Graham Bell correspondence. There are five examples of the signature of the inventor of the telephone which open the sale, including a cheque and four letters. These are taken from his employee A W Clime's collection, with two typed and signed addressed to Clime himself. Firstly, there is a four page letter from Bell to his wife, on Beinn Bhreagh, Nova Scotia letterhead, dated April 17, 1917, signed in ink by Bell as "Your loving Alex". The letter details Bell's rather amazing trek from Washington back to Nova Scotia, including a row-boat trip across an icy channel with an assistant in an attempt to circumvent a closed passage to his estate. This is a handwritten letter from Bell to his parents, dated June 10th, 1878, and signed in ink by Bell as "your loving son, Alex". 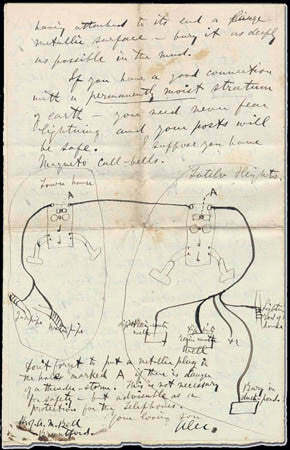 The letter announces the name of Bell's daughter to his parents and offers detailed description and a drawing explaining how to prevent electrocution during a lightning storm, and features Bell's own drawings of a telephone terminal and connection. In fine to very fine condition, this is a fantastic item, not only marking a very significant moment in the famous inventor's life but with his own depiction of the invention for which he is renowned all over the world. It is conservatively estimated at $10,000-12,000 in the August 11-13.